He may have meant that comment to be taken rhetorically, but I took it quite literally. Dogs are the best. There are, and have been, so many great dogs in this world. 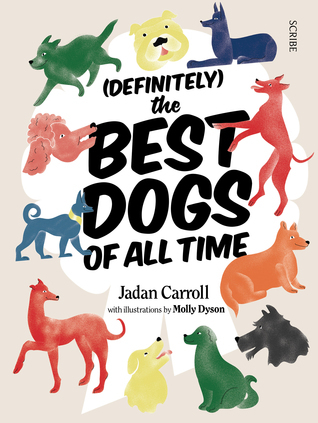 I reeled off a list of my favourite dogs from throughout history and suggested that we publish a humorous illustrated gift book about the best dogs of all time and call it (Definitely) The Best Dogs of All Time. I was happy enough just to make the rest of the office laugh, but everyone seemed to be very on board with the idea. I took a couple of nights to write up a proposal and it was jointly commissioned by our Senior Commissioning editor Marika Webb-Pullman and our Art Director Miriam Rosenbloom the following week. The whole thing was turned around very quickly; I researched and wrote it in about three months at night or on weekends. Miriam Rosenbloom, our art director, suggested approaching Molly Dyson to illustrate it, I already knew Molly and was a huge fan of her work so I was quite thrilled by that happy coincidence and even more so when she said yes. She did such an amazing job working to a very tight schedule and the finished book looks amazing. She has such a unique style, and is fast becoming a highly in-demand designer and illustrator in the music and arts scenes in both Australia and Germany, so I felt very lucky to have her involved. Our production manager Mick Pilkington described it as ‘shot-gun publishing’ and this seems like an apt description. It was such a fun project to work on and I’m very proud of it. 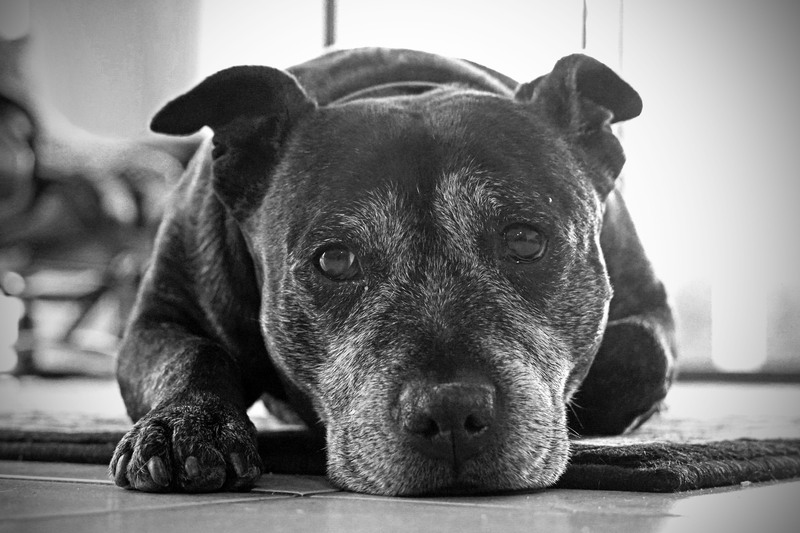 This is a fun and interesting read, the perfect gift for all dog lovers- however as the English Staffordshire Terrier is not represented on these pages – I have rectified that omission with this image of Bob the Dog – our furbaby and best friend. 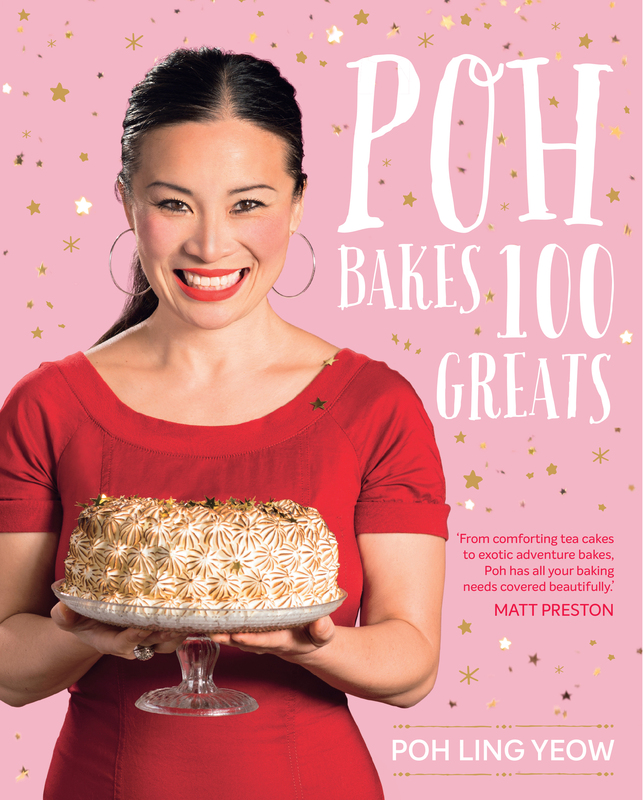 Images and recipes from Poh Bakes 100 Greats by Poh Ling Yeow (Murdoch Books, RRP $39.99) Photography by Alan Benson. 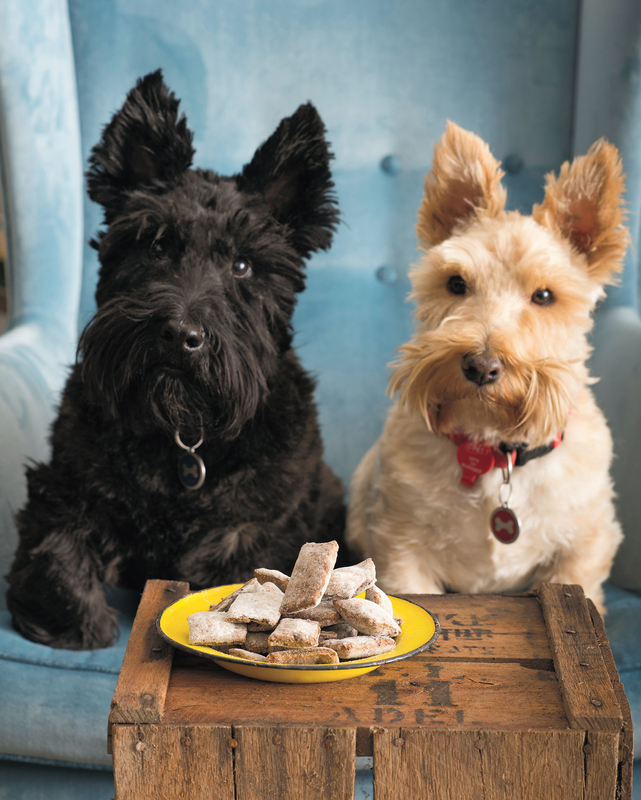 First, let’s be clear, these biscuits are for dogs, not humans! If you’re like me and get a bit stressy about the dodgy regulations that surround pet food, you can make your own. My guys, Rhino and Tim, are totally obsessed with these, and the best thing is that they’re incredibly easy to whip up. Preheat the oven to 110°C (225°F) fan-forced. Combine all the dry ingredients in a food processor, and pulse very briefly to mix. Add the livers, eggs and parsley, then pulse until the mixture gathers into a rough dough. Turn out onto a floured work surface, sprinkle more wholemeal flour on top and roll until 6 mm (1/4 inch) thick. Slice roughly into 4 cm (11/2 inch) squares, and bake for 1–11/2 hours until dry and crunchy. If the bikkies seem a little rubbery when you take them out of the oven, don’t be concerned – they’ll turn super-crunchy on cooling. Cool completely before storing in an airtight container, then use freely to manipulate your fur children into good behaviour! These keep well in an airtight container for up to 2 months. Just so you know, these dog biscuits are designed to be used as treats, not a kibble substitute. This is an outstanding read – it goes straight onto my “Best Reads of 2017 “list. In this riveting new novel by the New York Times bestselling author of the Chet and Bernie mystery series, a deeply damaged female soldier home from the war in Afghanistan becomes obsessed with finding a missing girl, gains an unlikely ally in a stray dog, and encounters new perils beyond the combat zone. LeAnne Hogan went to Afghanistan as a rising star in the military, and came back a much lesser person, mentally and physically. Now missing an eye and with half her face badly scarred, she can barely remember the disastrous desert operation that almost killed her. She is confused, angry, and suspects the fault is hers, even though nobody will come out and say it. Shattered by one last blow—the sudden death of her hospital roommate, Marci—LeAnne finds herself on a fateful drive across the country, reflecting on her past and seeing no future. Her native land is now unfamiliar, recast in shadow by her one good eye, her damaged psyche, her weakened body. Arriving in the rain-soaked small town in Washington State that Marci had called home, she makes a troubling discovery: Marci’s eight-year-old daughter has vanished. When a stray dog—a powerful, dark, unreadable creature, no one’s idea of a pet—seems to adopt LeAnne, a surprising connection is formed and something shifts inside her. As she becomes obsessed with finding Marci’s daughter, LeAnne and her inscrutable canine companion are drawn into danger as dark and menacing as her last Afghan mission. This time she has a strange but loyal fellow traveler protecting her blind side. 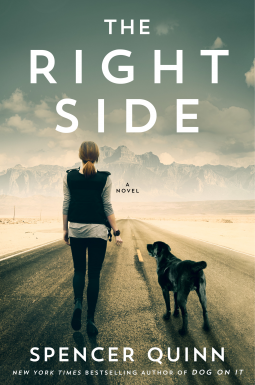 Enthralling, suspenseful, and psychologically nuanced, The Right Side introduces one of the most unforgettable protagonists in modern fiction: isolated, broken, disillusioned—yet still seeking redemption and purpose—LeAnne takes hold of the reader and never lets go. If you are expecting another narrative in the style of the Chet and Bernie series – think again. I strongly suggest that you begin this book as if you have just discovered a new to you author – just expect this to be a brilliant read – and then you will not be disappointed. For me this is a book that demands to be read in one sitting. The characters are complex – the psychological revelations are insightful and useful. You will navigate heartbreaking traumas to reveal the small ray of sunshine, of optimism that prevents this book from being morose and sullen. The mysteries here will keep the pages turning and you will gain a few perspectives that might surprise you and make you think. This is an outstanding read and I imagine one that will soon be transformed onto the big screen – I wish I had the $$ to produce this one. It will be a winner – guaranteed. 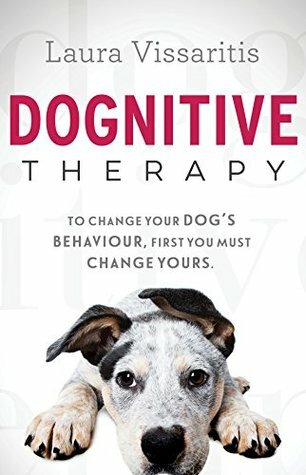 To change your dog’s behaviour, first you must change yours. A mindful approach to training your dog from Australia’s leading dog behaviourist. Training your dog starts with you. In this friendly and comprehensive guide, expert dog behaviourist Laura Vissaritis teaches you how to better understand your dog’s behaviour and, more importantly, how to change it. Your bond with your dog is incredibly powerful and rewarding, but it is also an instructive relationship. Your dog’s behaviour is directly affected and influenced by your own. Based on successful principles of dog-training and psychology, Laura demonstrates how implementing small changes in behaviour can have a big impact on both you and your canine companion. Packed full of real life case studies, exercises and practical advice, this book will inspire you to take a closer look at your own life to improve your relationship with your dog for good. I had many “aha” moments when reading this book. The advice, the case studies, the challenges…the rewards, all made so much sense. There are laugh out laugh out loud moments (did you know there is a scientific reason why sometimes your dog smells a bit like cheese nachos? You aren’t imagining things…it’s about sweat glands, see p215) 🙂 There were also times when I had a silent little weep and thought about rescuing another dog after reading the statistics Laura Vissaritis shares regarding animal cruelty, the battle animal rescues have in re homing dogs, especially older dogs and the case studies she shares about how dogs can add so much value to your life. 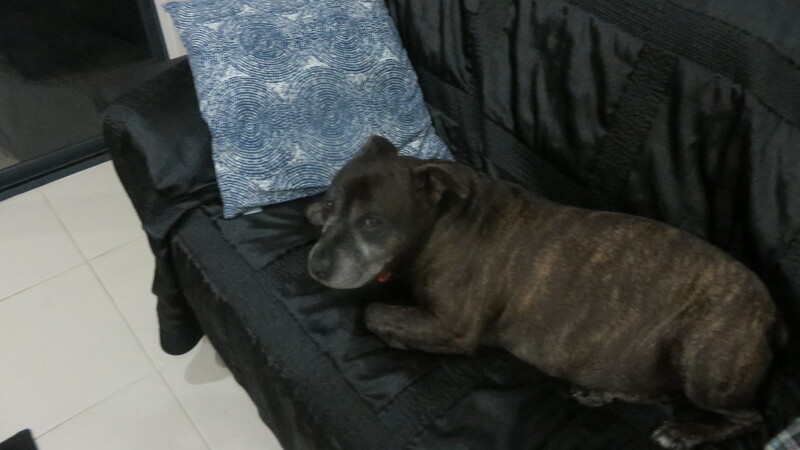 Our Bob the Dog is a “rescued” English Staffordshire Terrier – he gives us so much love, we return that love willingly – in abundance. We have a great relationship with Bob the Dog that has been enhanced by reading this book and being reminded to look at the world from your dog’s perspective and to remember that your dog will always be dependent on his human…always, forever. Laura’s passion for her work is evident. Laura’s love for her dogs shines like a beacon in the book. To claim this book elicited an emotional response from me would be an understatement. If you have a dog, love dogs, or have always wanted to share your home with a dog I urge you to read this book. The magic of this novel is in the read, and we don’t want to spoil it by giving away too many details. We can tell you that this is a story about that special someone: the one you trust, the one you can’t live without. For Ted Flask, that someone special is his aging companion Lily, who happens to be a dog. 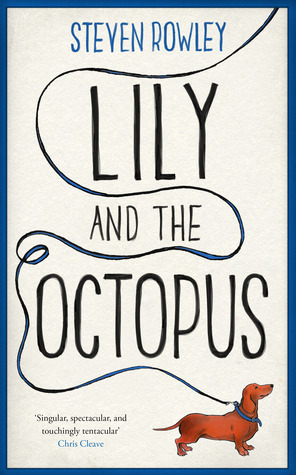 Lily and the Octopus reminds us how it feels to love fiercely, how difficult it can be to let go, and how the fight for those we love is the greatest fight of all. Remember the last book you told someone they had to read? Lily and the Octopus is the next one. I laughed and laughed…then I cried and not just a little tear but torrents of sadness. But don’t get me wrong this is largely an incredibly funny and intelligent read – the observations of life with dogs, searching for a soul mate, and Lily’s enthusiastic response to everything are sharp, hilarious, and often poignant; Lily and Ted do satire and sarcasm really well. It is the banter, the dialogue between Lily and her human companion that is so engaging and cute; but there is a depth and wisdom in the conversations here. Scratch just below the surface (you don’t have to dig too far) and the cuteness is quickly revealed as a mask that tries to hide Ted’s loneliness, depression, his battle to come to terms with his best friends devastating diagnosis and the journey through grief to acceptance. Does this sound like too much sharing and caring? It actually isn’t – Lily is a bright foil to Ted’s darkness and despair (and a great device that enables the reader to understand Ted’s perspective on life). The book is full of brilliant observations and it is a credit to the author that the reader cares so much for Lily and Ted. Welcome Julie Goodwin to my blog. 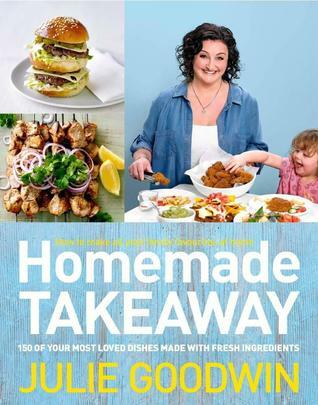 As the first winner of Australian Masterchef Julie needs no introduction – her name is synonymous with fresh food and fun family friendly recipes which she shares in her five acclaimed cook books. Thank you Julie for spending some time with us today. I have written 5 cookbooks . Our Family Table, The Heart of the Home, Gather, 20/20 Meals and Home-made Takeaway. When I was young I played clarinet in Hornsby Concert Band. My favourite ingredients to cook with are garlic, lemons, eggs. My biggest cooking disaster was when I opened the door to my dinner guests and the dog got up on the table and ran away with a whole roast chicken in his mouth. When I am not cooking I am hanging out with my boys and my dogs. My charity work involves doing various things for Oxfam, ChildFund, McGrath Foundation, Cure for MND Foundation, Coast Shelter. My Masterchef highlights are when I won the cupcake challenge with my Lemon Diva, and cooking at the Hong Kong Jockey Club. The most treasured items in my kitchen are my teacups and saucers. Some belonged to my nan, some to Mick’s grandma and mother, and others I have collected from various places over the years. If you would like to leant more about Julie – her recipes, cooking school (Julie’s Place),blog, charity work and more please click on the link below. Meet our very clever dog. He always knows just what we’re saying to him. He knows, but does he always obey? A funny story about a clever (but not always obedient) dog, from a father-daughter team of dog lovers. From playing in the park to dinnertime, bath time and bedtime – this very smart dog knows what’s going on! 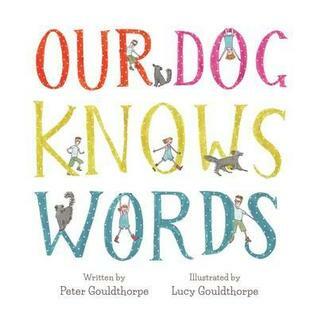 If you loved THE COMPLETE GUIDE TO A DOG’S BEST FRIEND, HENRY THE DIRTY DOG or HAIRY MACLARY then you will adore OUR DOG KNOWS WORDS. Fun, charming and a delight to read. This is a perfect book to read to your toddler or for your pre-schooler to read along with you. Anyone who has a dog or loves dogs will smile and nod their head in agreement as they agree with the sentiments and observations expressed here. Put this one of your Christmas shopping list – (it comes in hardback and paperback), and watch the smiles on Christmas morning.